It's easy to find wedding rings in any jewelry store, but it can be a little trickier to find one-of-a-kind, unique wedding bands. For bands that are as special as you and your fiancé, you'll need to get creative. Most jewelry stores carry wedding bands. You'll find a wide variety of styles, including plain gold bands, engraved rings, rings set with diamonds and precious gemstones, and bands designed to surround your engagement ring. However, if you're looking for a truly unique style, you'll need to consider alternative resources. Expect to pay a little more if you work with a well-known, established jeweler. Since jewelry artists crafts each piece by hand, you'll be paying for their time and expertise, as well as the materials needed for your rings. Ask to see previous work. 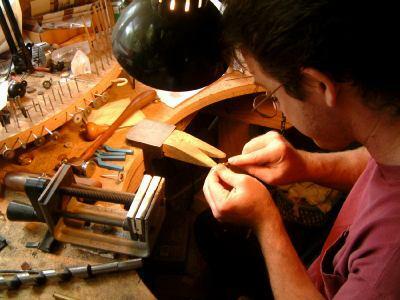 Most custom jewelers are proud to show you pictures of their past creations. This will give you an idea of the jeweler's style. Make sure the jeweler understands you're looking for a one-of-a-kind design. Be clear about your expectations, and you'll be more likely to get exactly what you had in mind. Get a mock-up or drawing of your wedding bands. Many jewelers are happy to create an image that shows your rings, and this will allow you to provide input about the design and any changes you might want. If you're concerned about the expense of a custom ring, consider working with a less experienced jewelry artist. Many art schools and universities are happy to recommend talented students who can create your unique wedding bands. You can also buy a plain gold ring at any jewelry store and have it custom engraved with a message or design. This is an affordable way to get a set of one-of-a-kind, unique wedding bands, since custom engraving is typically more affordable than commissioning custom jewelry. You can have a special message engraved inside your ring, or you can have an artist engrave a beautiful design on the outside of the band. Another great way to get a unique wedding band is to buy a vintage or antique jewelry piece. If you love history and vintage fashion, you're sure to find wedding bands perfect for you. Antique rings are at least 100 years old, and vintage rings were created between 20 and 100 years ago. Since these designs are decades old, you're unlikely to see the same ring on a friend's finger. Vintage rings are also a great way to save money on your wedding jewelry.